In 2006 the AZUR Development organization carried out a project looking at the psychological and social supports for 100 people with HIV. Most of these people were women living in Pointe-Noire, Congo. Through the project they discovered the extent to which these women had been dispossessed of their property, and abandoned by their spouses and families. The project kicked off AZUR Development's work on advancing the rights of people living with HIV. The organization is now taking things a step further, by documenting the stigma and discrimination faced by people infected and affected by HIV/AIDS in Congo. 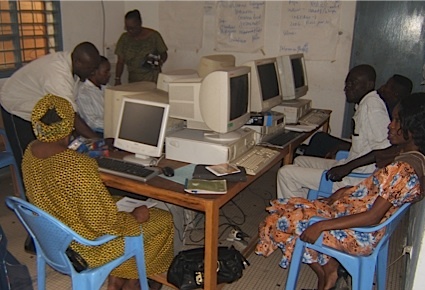 They are training communication officers and leaders of local HIV and AIDS organizations, members of their AIDS Network Africa initiative, in digital story telling (including video and photography), podcasting, and blogging. Each communication officer will then use this technology to share stories of how HIV/AIDS is affecting the local community where he or she works. This project is one of the six new health-focused citizen media outreach projects that were announced in June by Rising Voices and Open Society Institute’s Health Media Initiative. People living with HIV/AIDS have some of their rights harmed because of their serological status and receive very little assistance in defending them…This project allows us to document the stigmatization and discrimination of people living with HIV, in particular women infected by HIV in Congo, in their own words and those of the organizations of which they are members. AZUR Development's main office is located in Brazzaville, the capital and largest city in Congo. The city rests on the west side of the Congo River across from Kinshasa, the capital city of neighboring country the Democratic Republic of the Congo. This video shows some images of Brazzaville. Though the organization is based in Brazzaville, it works to provide leadership in the socio-cultural and economic development of all of Congo and Africa. Their projects range from providing leadership skills to young women to using information and communication technologies for development to work focused on HIV/AIDS. Technology has played a big role in their work. They started blogging in 2006, writing about the organization's activities in Congo, and then launched a blog on the rights of native people (Pygmy groups) in Congo. 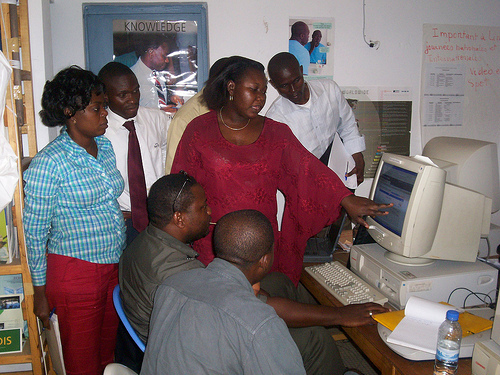 They also coordinate an initiative called AIDS Network Africa, for which they have a blog that recounts stories, testimonies, and activities on HIV/AIDS and malaria from the network's members, and have conducted workshops on the use of computers and the Internet. These photos show some of their projects. People living with HIV/AIDS are laid off because of their illness, sometimes without accompanying measures; very few employers agree to give responsibility to HIV positive employees; they are dispossessed of their property by their families especially when they are in the final stages of the illness; they do not have access to quality care and to antiretroviral treatment in rural areas; and very few of the people living with HIV/AIDS know what their rights are and how they can contribute to safeguarding and defending them. In particular, women infected with HIV are the most vulnerable. They are accused of having brought the illness into the family and are abandoned or chased from their homes. The organizations welcomed this action [the workshops] of AZUR Development, because they told us that they always asked their local partners to strengthen their capabilities in the efficient use of the Internet to no avail. This project thus responded to a real need in the field to make use of technology to advance the rights of people living with HIV. AZUR Development has finished the initial training, and has began publishing the communication officers’ articles on the project’s blog in French and English. The next step is to buy audio equipment, so they can begin podcast training. Interview with Sylvie Niombo translated from French by Sabriya Fisher. Not only will this project help to educate the readers, but I imagine that it will also be very therapeutic for the participants to speak about the stigmas and struggles they are often faced with. Welcome to all, and I can’t wait to read their stories!